The world of bridal gowns and attire is studded with prominent names of designers with their signature styles, of which help one bride to stand out from the rest. If you are after a pompous, bespoke, or custom-made dress, with a signature ball gown style and a corset top, then Vera Wang is most likely the designer you have set eyes upon. If on the other hand, an A-line silhouette, studded with hand-cut lace is your choice, then Carolina Herrera’s name should be your style inspiration. Even though these designers create exceptionally amazing works, many up-and-coming names are proving they can master the unexpected. Among all the amazing choices, you will find the wedding dress of your dreams! A native to the Mediterranean Greek islands, the stylist Christos Costarellos manages to produce a beautiful style that is a delicate merge of a Mediterranean look with a Parisian accent in detail and quality of fabric. Costarellos uses a mixture of several types of lace in any given piece of work, creating a polished and sophisticated twist to the boho-chic style. Each dress fitting will present you with an exciting array of new textures to add to your chosen gown as well as edgy and accented details, an ideal choice for the bride-to-be who is split between the effortless and the more elegant and sophisticated style. Emerging from the dream and vision of the two sisters Cristina and Yolanda, Yolan Cris is a family-run brand based in Barcelona. The brand Yoland Cris focuses on the mantra and understanding that a bridal gown is one with a specific intention, and an accented vantage point – one that stands out. The styles are particularly polarizing, packed with ample potential and unique qualities, with a particularly aesthetically pleasing air and individualistic style to them. Both their range of bridal gowns and luxurious evening wear collections are seemingly endless. 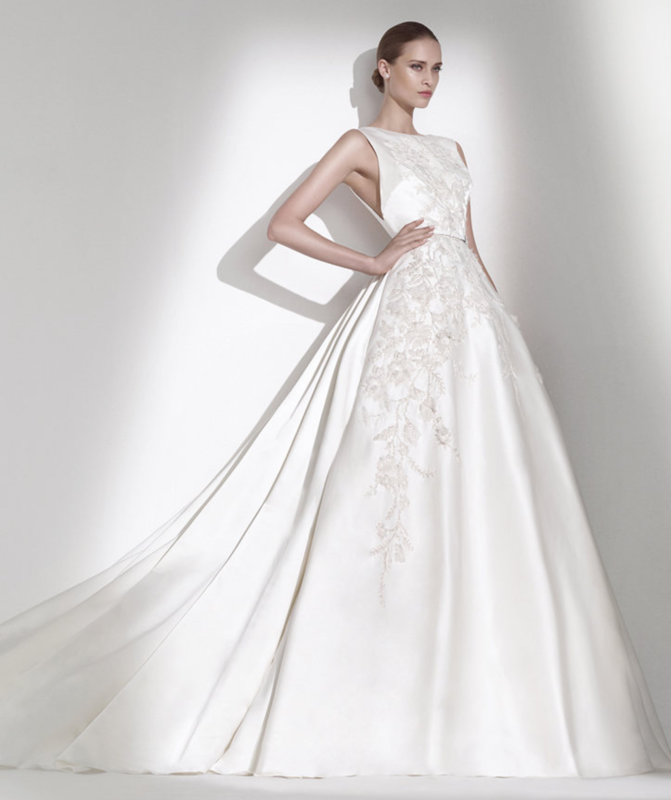 A more seasoned name in the bridal gowns sector is Elie Saab, a designer name which recently took the leap from solely bespoke dresses to a fresh range of made-to-measure styles. Their range of ready-made gowns is available in 13 countries, including the United States, giving the customer the freedom to try on any gowns from their range with ease. The gowns are a beautiful, hopelessly romantic, studded with mesmerizing hand-cut lace, with the option to purchase accessories as well as toppers from their extensive range of unique add-ons for the high-end bride-to-be.